3H / 3P Height + Pressure Air Management gives you all the advantages of height sensors and the added intelligence of a system that also considers pressure. Both systems come with the Air Lift Performance 3 controller, a device that is truly amazing to hold and to use. Take full control of your 3H/3P system with a FREE mobile app with no additional hardware needed, for all compatible devices. By combining the ECU, pressure manifold, and Bluetooth module into one compact unit, the new manifold takes up less space than multiple components. The system quickly adjusts to and maintains height and/or pressure presets with the push of a button. The system comes with everything needed for height and pressure control up front, for the best value. Start driving in pressure mode and install height sensors later, without the need to purchase an upgrade. Height sensors give the system the ability to automatically adapt to changes in vehicle load. With the combination of pressure and height sensing technology, 3H can achieve the correct height without radical differences in pressure. Turn your vehicle off and continue to control your air management via the controller or FREE mobile app. Turn the key and the system will take you right to your programmed ride height. The key components of this system require less drilling, wiring, and take up less space than other air management systems for a cleaner install. Take your air game to a whole new level with our intuitive controller, featuring a full color display and rotatable keypad, tailored to your vehicle’s setup. Updated system software can be sent directly to the manifold and controller via the mobile app! Use your compatible mobile device as the controller. The ultimate air suspension setup needs the most advanced manifold. No compromise has been made, using the best components and materials in existence. The state-of-the-art 32-bit processor powers advanced height + pressure algorithms for the most precise 4-corner control. 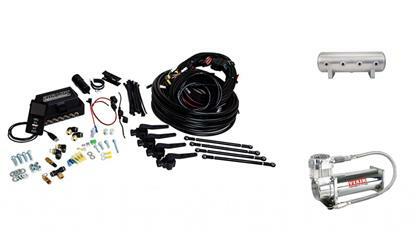 The system comes with a simple and streamlined wiring harness for an easy and clean install. 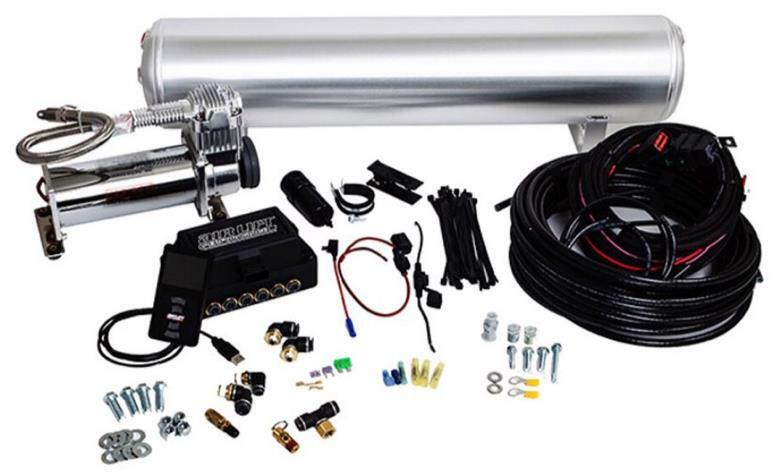 Less components to buy and install with the ECU, manifold, and Bluetooth in one. No antennas, hardware, or additional accessories are needed to connect your mobile device to the manifold. The system detects the movement of the vehicle and makes accurate and intelligent adjustments at the right time. The compact design, harness connector location, and rotatable logo plate all allow for limitless placement options.